KANSAS CITY, Mo. 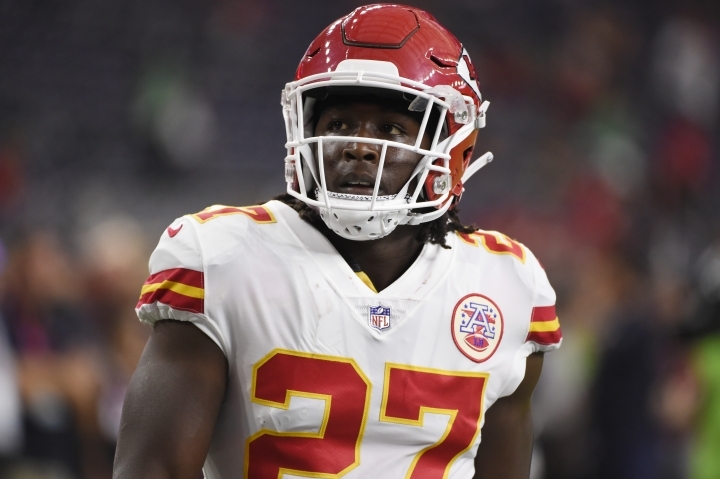 — Kareem Hunt's status with the Kansas City Chiefs was in limbo Friday night after video surfaced of the reigning NFL rushing champion knocking over and kicking a woman at a Cleveland hotel hallway. Hunt was at the Chiefs' facility earlier Friday in preparation for Sunday's trip to Oakland, but was excused and sent home, a person with knowledge of the situation told The Associated Press. The person spoke on condition of anonymity pending a formal statement from the team. The person also said that it is possible Hunt could be placed on the NFL's Commissioner Exempt List, which would effectively sideline him while the league investigates the video. Being placed on the exempt list means the player is paid and does not count against the club's 53-man roster. But he can't practice or play until he is removed from the list. Foster has since been signed by Washington and put on the NFL's exempt list. Meanwhile, the Chiefs and the NFL have been aware of Hunt's incident since it occurred, but the video brings a new dimension to the case. It shows Hunt lunging toward a woman and several others in the hotel hallway, and the second-year pro being restrained several times. When asked about the offseason incidents during training camp, Hunt replied: "I've learned from it and just focus on football." When asked to elaborate on the lessons he learned, he replied: "Just be in the right place at the right time." When asked during camp about Hunt's offseason incidents, Chiefs chairman Clark Hunt acknowledged that "young men are not always going to make the best decisions." "But we have a strong support system, both with the coaching staff and also with our player development that works with young guys and talks to them about the situations that they want to be in," the chairman said. "Kareem is a young man, second year in the league, obviously had a very big year on the field last year. I'm sure he learned some lessons this offseason and hopefully won't be in those kind of situations in the future."